NFPA Certificated Marine Chemists are holders of a valid Certificate in accordance with the Rules for the Certification and Recertification of Marine Chemists (PDF, 174 KB) establishing they are qualified to determine whether entry and work within confined spaces on marine vessels and within shipyards may be undertaken safely in accordance with NFPA 306, Standard for the Control of Gas Hazards on Vessels. NFPA Marine Chemists are distinguished as the only independent specialists incorporated by name in both U. S. Department of Labor (OSHA) requirements for shipyard employment and U. S. Coast Guard hot work regulations. Registration of trainees is decided by the Marine Chemist Qualification Board (MCQB). It is important that you complete the application and provide as much information as possible to assist the MCQB in its consideration of your application to register as a trainee. Please be advised that approval for registration as a trainee is the first step in the process to become a NFPA Certificated Marine Chemist. Approval of your application to register as a trainee is not a promise or guarantee that you will be certificated as a Marine Chemist. There is a non‐refundable fee of $250.00 that must be submitted with the registration application. If you have any questions regarding the process, please contact the NFPA Marine Field Service at +1 617 984-7418. Participants in this seminar will be able to develop and implement practices and procedures essential to safely entering and working within confined spaces. Get more information. The United States Coast Guard requires that a Certificate issued by a Marine Chemist is obtained before hot work or fire producing operations can be carried out in certain spaces aboard a marine vessel. Details concerning the U.S. Coast Guard regulations can be found on the U.S. Government Printing Office’s website. 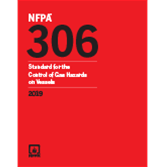 Trust NFPA 306 for guidance where combustible and flammable materials are present on marine vessels. Maritime Confined Space Safe Practices Seminar The 3-day training seminar is based on OSHA’s maritime confined space standard, 29 CFR 1915, Subpart B and NFPA 306.